This movie seems before Charles Bronson’s Canon films days, at least I think so, I don’t remember seeing the Canon logo at the beginning, A logo which screams 1980s B-movies simply because they were the forerunners of the content. Funny as a kid watching Bronson, I never considered him an old man, or rather I never noticed that he was older than the other action heroes of the 80s. In this day and age I’m not sure if that manners, Bronson was the same age in the 80s as most of the bigger Action stars of the 80s are now. I would like to think that one reason Stallone and Schwarzenegger keep going is because they kept repeating to themselves “Bronson did it!” In fact, most likely Bruce Willis (Who was a baby action star when Bronson was on the tail end of his action career) is the same age Bronson was when he did the remake of Bronson’s action franchise, Death Wish. 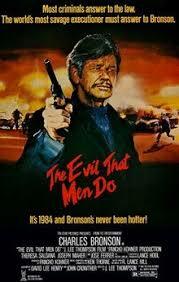 Bronson’s is a pretty well kept man for his age. That’s important to be believable. He looks like one of those works with his hands type of guy, the type of crafts man who loved what he did do much he did it for his entire life and it helped him keep in shape. It’s good not to let yourself go (or be like me and never be in shape in the frist place). The biggest misfire of this film not being a canon film is that their is not enough action, and the biggest problem with that is that the entire film is a slow burn about Bronson being an Ex-CIA agent brought out of retirement to investigate the murder of a journalist he knew, and it has one really amazing action sequence that does not even come at the end of the film. It’s a car chase with a lot of gun play and it was a strangely huge spark in a film that’s really leveled down. So werid, the movie would have been better off without it cause once it happens all I wanted it is to see more and I knew the film would not deleiver. So like mid-way into the movie I stopped being interested.